IRVINE, Calif. – Razer, the world’s leading lifestyle brand for gamers, announced today a Quartz Pink edition of its Razer Blade Stealth ultraportable laptop. It is the latest addition to the bestselling popular Quartz Pink product line. The Razer Blade Stealth’s beauty is only matched by its durability. Anodized at the sub-molecular level in futuristic pink, the laptop is machine milled from a single block of high-grade aluminum. Emblazoned on the back of the display is a subtle pink tone-on-tone Razer logo to complete the mesmerizing Quartz Pink effect. Designed for both work and gaming, the Quartz Pink limited edition is available with NVIDIA® GeForce® MX 150 4GB graphics and a Full HD (1920 x 1080) display. The new side bezel design provides for a visually stunning edge-to-edge picture at only 4.9mm thin. The display provides up to 100% sRGB color space for vivid colors, and improved power efficiency for longer battery life. 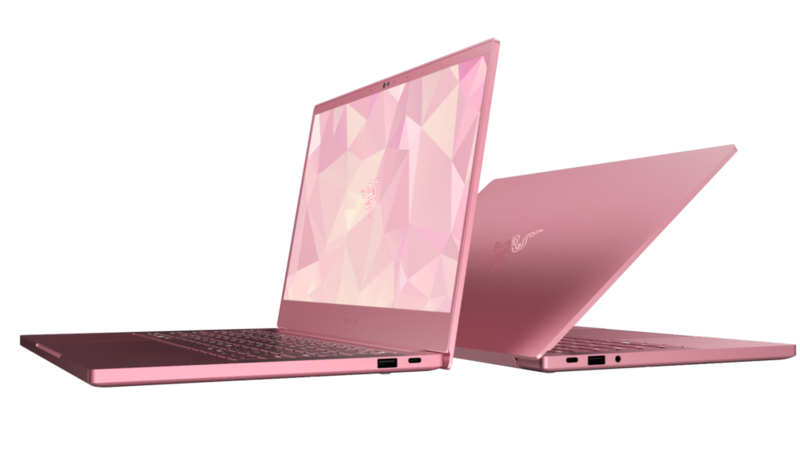 Like the original black variant, the Quartz Pink limited edition will have 16GB of 2133MHz dual-channel memory, a Whisky Lake 8th Gen Intel® Core™ i7-8565U processor, a 256GB PCIe M.2 SSD and up to 11 hours of battery life. For additional security and convenience, the Razer Blade Stealth comes with a IR web camera that supports Windows Hello. Razer’s advanced thermal system and new power management options have been integrated into Razer Synapse 3 software to maximize battery life, silence fans in a meeting, or provide full power when gaming. The laptop is also equipped with Intel® UHD Graphics 620, and it will leverage NVIDIA® Optimus technology to dynamically switch between the integrated and dedicated graphics to provide maximum performance and battery life when users need it. And at under 3 lbs., the Razer Blade Stealth Quartz Pink limited edition will never make your shoulders ache. Or your heart for that matter. The Razer Blade Stealth Quartz Pink edition will be available for a limited time only in the USA, China and Canada starting January 29th for $1,599.99. Razer.com now offers RazerCare Elite protection plans for all Razer Blade laptops and phones, providing a total of 3 years of coverage that now covers accidental damage along with 24-hour phone support and repairs by Razer-Authorized centers with free 2-way shipping. Additionally, Razer announced today the release of eight new Quartz Pink peripherals such as the Razer Huntsman keyboard, the Razer Seiren X Quartz microphone, and the Razer Base Station Chroma. Keyboard with Razer Chroma™ single-zone full key backlighting and anti-ghosting technology.